1 Mix the flour and yeast in a large bowl, then stir in the sugar. Add 150ml hand-hot water, plus 1 tbsp of the oil and mix to a soft dough. Knead on a lightly floured surface for 5 minutes, then return to the bowl, cover with clingfilm and leave for 45 minutes to 1 hour, or until doubled in size. 2 Cut the aubergines lengthwise into thin slices, then brush on both sides with oil. Heat a griddle pan or frying pan and cook the aubergine slices for 2-3 minutes until golden on both sides and softened. Remove to a plate. 3 Heat the oven to 220°C, gas mark 7. Line a large baking sheet with baking parchment. Knead the dough briefly, then roll out into a 30cm round and transfer to the lined sheet. 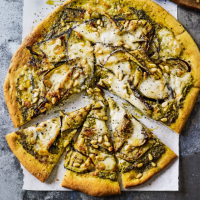 Spread evenly with the pesto and arrange the aubergine slices on top. 4 Tear the mozzarella into pieces and scatter over the pizza with the pine nuts and Parmigiano Reggiano. Bake for 15-18 minutes until the pizza base is golden and crisp.